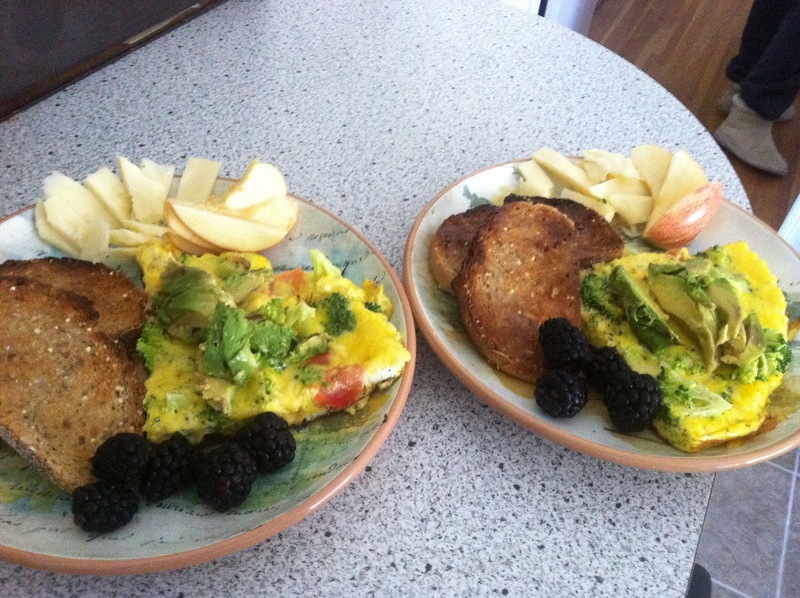 I am SO glad to be back HOME, cooking and blogging again! James and I returned to the states just 5 days ago and I'm still heavily jet-lagged. (hence the no blogging thing) HOWEVER, this morning I woke up with so many fun ideas and some really great news to share with you, so I'm back on the horse! Thanks so much for being patient with me as we were away for so long and without our normal routine of creating masterpieces in the kitchen everyday! SO, get this: Jordan and Brent (my sis and her hubby) couldn't make it to Australia for Christmas to join us all, so this past weekend when we got back, everybody drove up from Charlotte to spend a few nights in our place so we could have our normal family Christmas. (it was so great... Jim Brickman was even played, just as tradition calls for) My clever, thoughtful and out-of-the-box thinking sister and brent surprised me with the best gift ever.... RECITHERAPY.COM! Yes! That's right! No more 'blogspot' blocking the flow of our brilliant name.... it's now just plain old, perfect recitherapy.com and we are SO EXCITED about it! THANK YOU THANK YOU THANK YOU, jd and brent for being so fun and thoughtful and for blessing me with that! (i totally feel more 'official' now... i am more official now) From now on, get used to it... type in www.recitherapy.com to read up on everything, and leave out mr. blogspot. cook 2 strips of bacon in a cast-iron skillet on medium heat until crispy. you'll want to flip them once. while the bacon is cooking, grate a generous, but not ridiculous amount of extra sharp white cheddar... or whatever kind of cheddar you like, but I suggest it be sharp whether it's white or not. 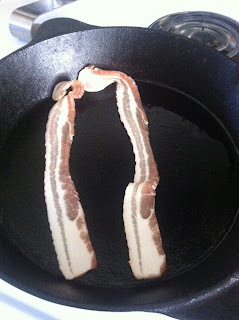 bacon should still be sizzling, so crack 6 eggs into a bowl and whisk. 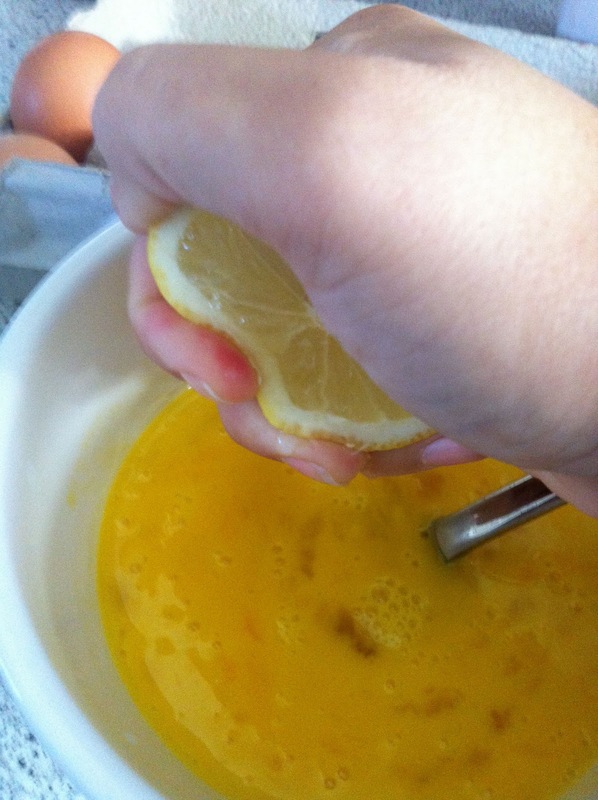 Then slice 1/4 of a lemon, and squeeze the juice into the eggs and whisk again. 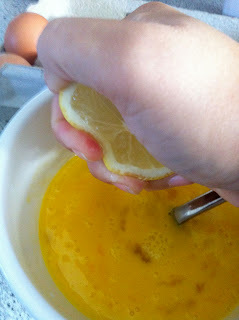 Now pour in about 1/4 cup half & half cream into the egg lemon mixture and stir just until mixed. 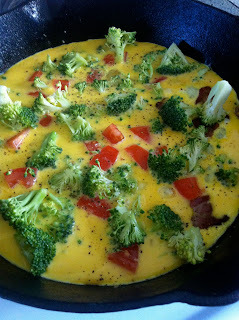 Grab a handful of broccoli and half a tomato and chop them up. 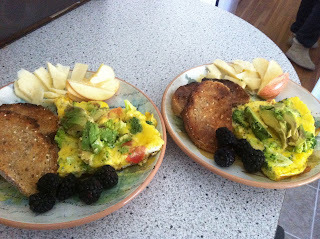 These are going right into your frittata fresh and raw. Now slice up half of an avocado in length strips. 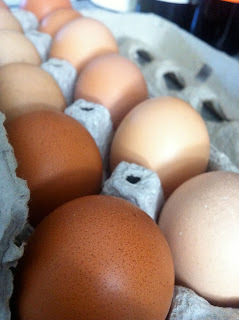 These will be used to top your frittata when it's finished. 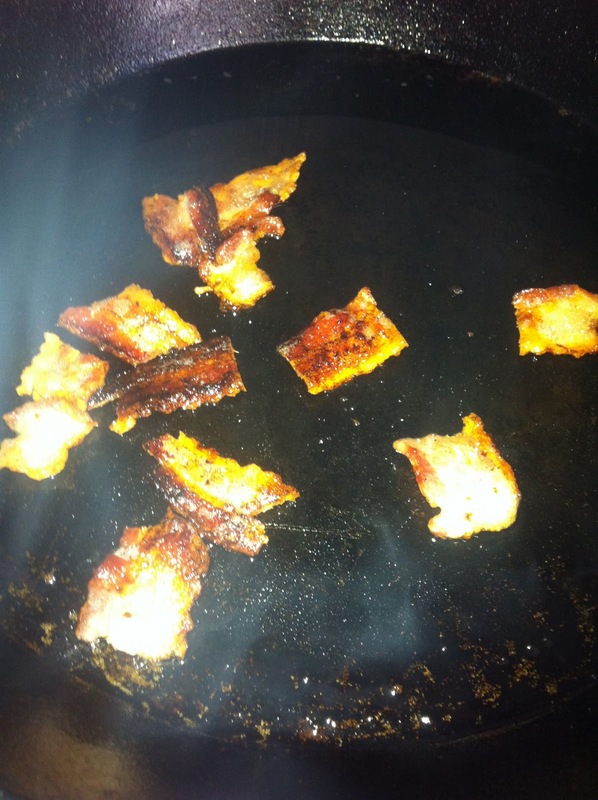 Now that your bacon is probably done, pour out the excess bacon grease (just tip it over the trash or into a bowl, do NOT put it down your sink. issues for weeks.) and slice up the bacon strips into inch or smaller size bits. 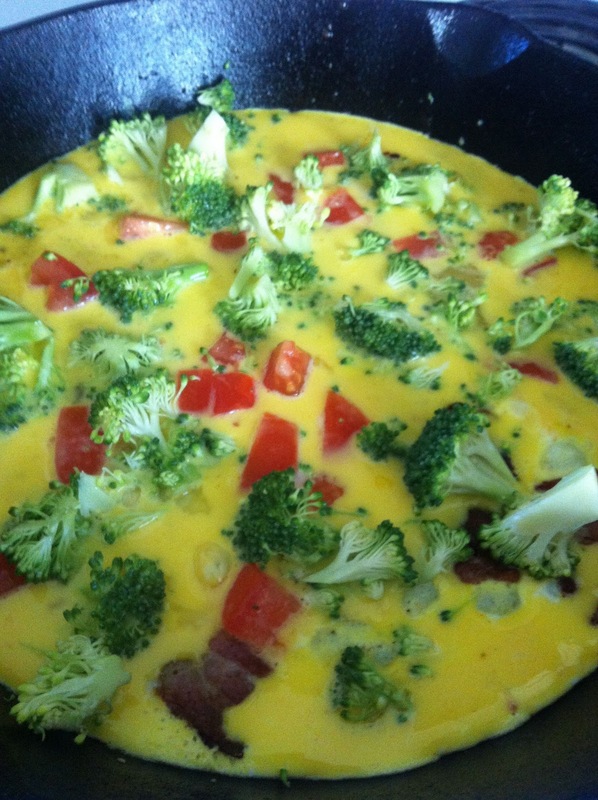 Pour the egg mixture right into the skillet over the bacon pieces and quickly sprinkle in all the broccoli and tomato pieces. 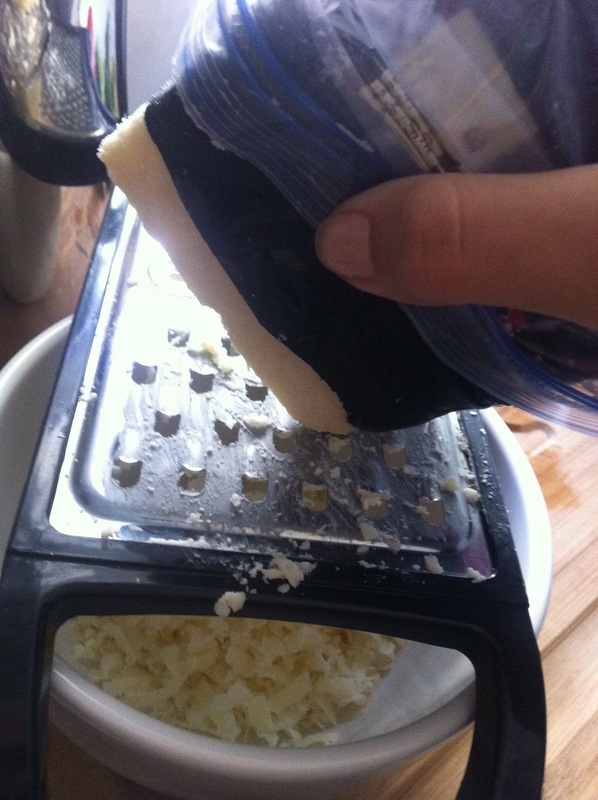 now drop that grated cheddar all over the top... sorry the photo stinks. I must've moved. Now put a lid on it and turn the heat back to medium low. While the frittata is cooking, slice up some fresh whole grain or sourdough toast. Don't put it in the toaster yet... you want it to go in when the eggs are almost done so that you're serving hot, buttery toast with warm fluffy eggs. Nothing's worse than warm eggs with cold toast... or visa versa. yes, that's honey. We're making honey butter to go with this frittata... isn't that something Bryant Park Grille would do? Slice off a generous amount of room temperature salted butter. I probably used 3-4 tablespoons. Put it in a little dish or espresso cup and pour in 1-2 tablespoons of honey. My wild flower honey is from a local nashville farmer and it's CRAZY potent, so I think I used just about a tablespoon and it was perfect. Mix it all around with your knife! See how the room temperature thing makes all the difference? 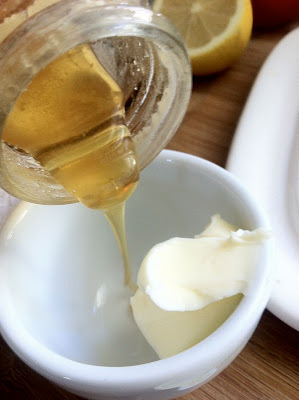 The honey really mixes better for a tastier texture if the butter isn't melted, just softened. 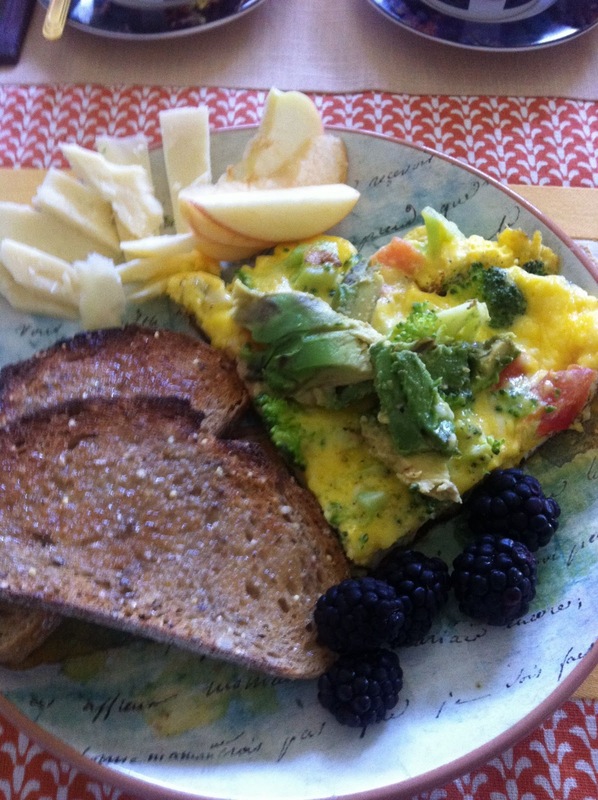 By now, your frittata should be close to finishing, so push down that toast! 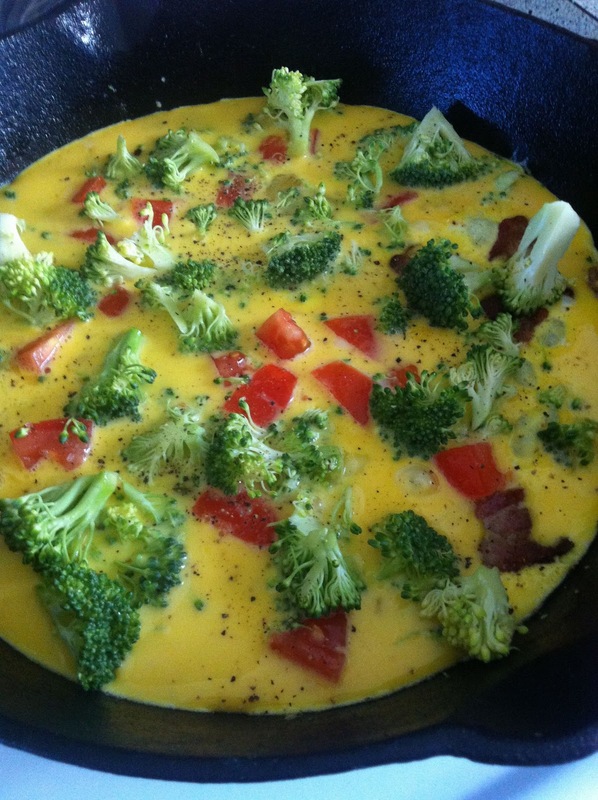 Grab a spatula and start to loosen up the edges and the bottom of the frittata... if it looks a little browned on the bottom, that's normal, you probably didn't burn it so don't worry about it. 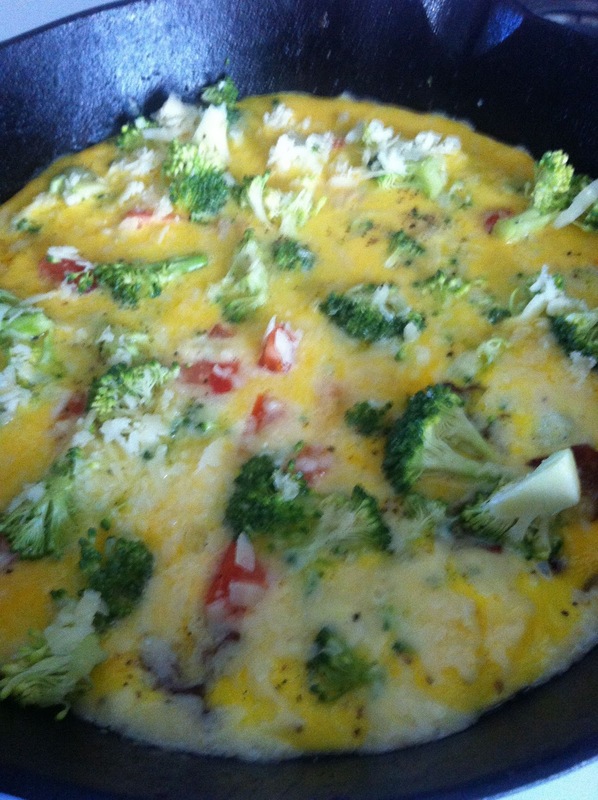 You want it to be pretty solid on the bottom anyways for serving purposes.. it'll come out like a pancake. If it's a little 'liquidy' on the top still, that's alright, as long as your fork can come out clean and it feels fluffy but solid in the middle, it's done! 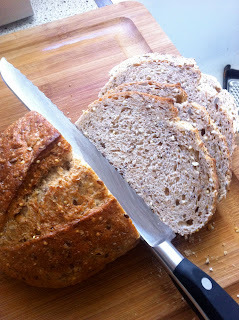 Now slice it into fours (or smaller if you're doing a light brunch thing) and dish it out! If it is, in fact, a little liquidy on top still, gently tip it as you spatula each piece out so the excess dripping comes right off. Now remember that avocado you sliced? Spoon out the long strips and lay them smack on top of the frittata slice for serving. 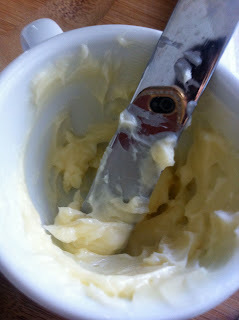 Honey butter that warm toast and serve with a little garnish of cheddar and apple slices, and maybe some blackberries! Or even a little martini glass of berries and plain yogurt! 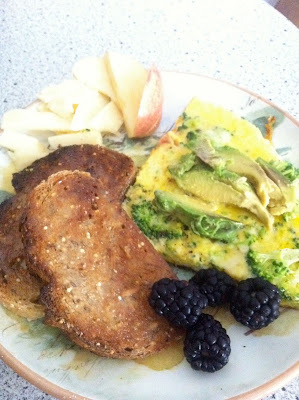 THAT, my friends, is a Bryant Park Grille worthy breakfast! I've successfully taken myself on a healthy, cheap, mini NYC vacation... and I highly suggest you do the same. And don't forget the coffee... make a french press. And if you don't have a french press, go get one. Really, it'll make your life feel SO luxurious, even if it's exactly the same as it was before you had the french press. Making french press coffee is the equivalent of wearing rose colored glasses. Always a good thing. LOTS and LOTS of love to you guys, and happy Bryant Park Tuesday!